There is a strange situation occurring in the Irish property market, arrears are rising rapidly, stock of repossessed homes is on the increase, and yet the number of repossessions is dropping; there is a contradiction in here somewhere. Per quarter the number of properties being repossessed is dropping, banks are taking back fewer and fewer houses, this would normally be a sign of prosperity, people with jobs and a stable property market would mean that there would be some equity in the property as people pay down debt and are able to afford their payments, but that isn’t the case, quite the opposite, Irish households are heavily indebted and arrears are rapidly rising. The largest number of properties being taken back is actually that of voluntary surrender (and abandonment), so there is no ‘repossession’ monster lurking in the Irish market because we have decided that we don’t want it to exist, this will come at a cost as we incrementally strip banks of their ability to enforce mortgage contracts. The stock of property being held by banks (which was given back via voluntary surrender or repossessed) is growing, does that mean they are going to hold and hope for appreciation or that they are concerned that the resale value will be far below expectation, are they renting the properties out or letting them sit idle? 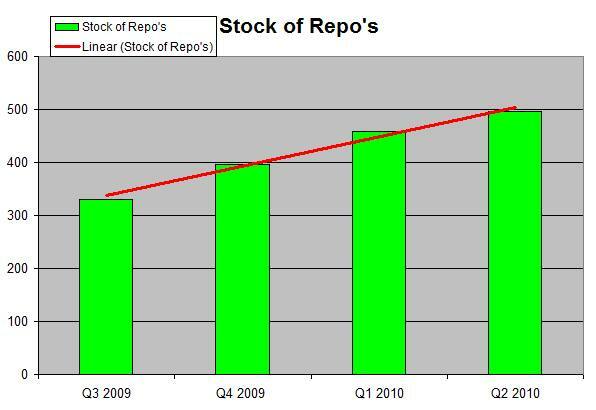 We don’t know, but a growing stock of repo’s tells you the opposite of the first chart, it says that things are not going well, it also tells us that banks are not offloading these properties and that could be a cause for concern. The shift in arrears is worrying, on average the rate of increase in arrears is c. 11% per quarter, which would (if the trend remains on an annual basis) give rise to a 50% increase in one year on the arrears profile. This means we could be looking at 40,000 households in arrears by q4 of this year and 50,000 by this time next year. 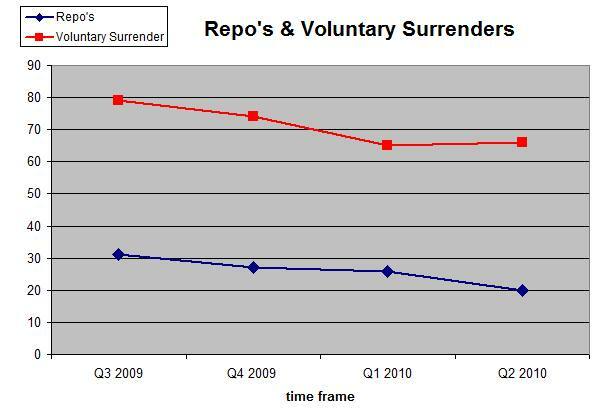 And yet during the same period repossessions have decreased and the stock of repo’d homes is increasing. 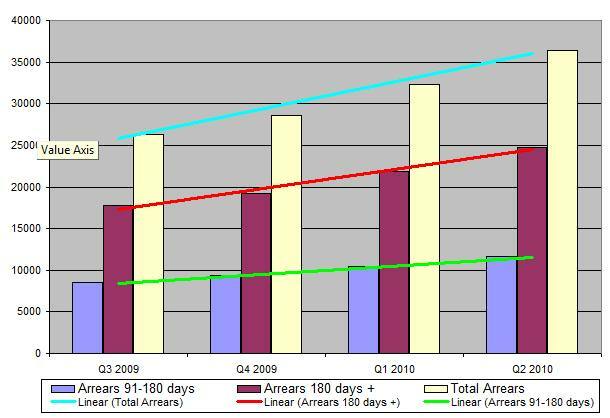 Every trend line is on an upward trajectory, with the most concerning increase occurring in the 180 days or more arrears group. This is the group that have not made mortgage payments to the tune of six months. That doesn’t mean problems arose 6 months ago, rather it can occur in steps, if you pay half a mortgage payment for a year you are six months in arrears. Where does it end? The only rational solution we can see is that banks start to move on properties, but there are barriers in the way, for a start, shareholders need to realise that allowing a larger stagnant pool of arrears to form is contrary to the health of a bank. The Regulator will also need to stop interfering in the arrears and repossession process, they have made it very difficult for a bank to take back a property, that trend should not continue any further than it has. Lastly, the banks need to make a decision of either allowing large sections of the loan book to go zombie-like or get honest with their operations and move in on clients holding assets they are not paying for. Or we can opt to kick the can down the road and hope the problem goes away at some stage as economic recovery occurs, but at that stage these borrowers will have less equity (or greater negative equity) and more arrears, why isn’t anybody shouting that from the rooftops? Getting of a burning ship is generally seen as a good idea, even if the sea is cold. A lot of questions there and the reality is, straight answers will be hard to come by. From an accounting perspective, provision for bad debts on a balance sheet does not read as poorly as bad debts actualised. Were the lending institutions to proceed with large scale repossessions then they will a) have to crystallise a loss on the balance sheet and b) become large scale property owners (which they are not equipped to do). As it currently stands they only have a charge over the property for the debt outstanding, if they take ownership of a property then they are immediately responsible for the costs of securing and insuring that property and ultimately have zero chance of receiving any return from the previous owner. Say for example, it costs €10000 per property per year including staffing, utilities, insurance, maintenance, repairs and i’m excluding interest foregone then, for the 36000 that are in “normal” repossession territory that amounts to €360,000,000 in additional costs p.a. for the lending institutions. Add into that all of those that have 12 month moratoriums or interest only agreements then you are looking at a minimum of 10% of the overall mortgage loan book being in a critical state. The lending institutions cannot let the properties out as they cannot sell without vacant possession, they cannot leave the properties empty as the costs have to be borne by them and they cannot sell because mortgage lending has fallen through the floor. So what do they do? Nothing. Better to have the responsibility with the crumbling family unit and the mortgage interest supplement than step up to the plate and provide a solution.